With industrialization in the late 1800’s, the use of flexible operable awnings became increasingly popular. Prior to the use of this hinged rope and pulley hardware, the only way to retract an awning was to roll it up by hand. Now a shopkeeper could protect his awning from sudden wind by quickly retracting the awning against the wall of the building and adjust it throughout the day, depending on the strength of the sun. However, the awning was attached to the building and would bunch up allowing damage and deterioration by rain, snow and wind. Modern technologies have eliminated these problems, creating designs known as retractable awnings. Advanced Belt Technology® available with Eclipse Shading Systems® replaces traditional pulleys, cables and chains. The difference is in the belt. ABT is designed specifically for the awning industry and is a revolutionary aesthetically pleasing tension system with a combination of power and durability. 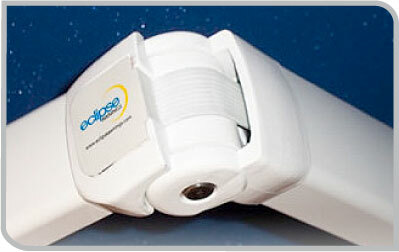 This breakthrough technology makes Eclipse a world leader in the awning market. There are over 600,000 ABT systems installed and operating today! Inside the poly carbon UV resistant covering are nine high carbon steel cables to improve the tension transmission of the arm, providing strength and durability that make the Eclipse Advanced Belt Technology the highest performing awning. Our ABT system’s mechanical resistance features, chemical stability and a life of 60,000 cycles are unheard of in the awning industry. With Eclipse Advanced Belt Technology in your awning system you’ll have the most stable and most attractive awning in the neighborhood!